I made this over the weekend, and was just expecting a normal baked chicken dish nothing special. I think everyone was shocked about how amazing this dish was. Seriously the sauce alone is worth it, then there was the tender and moist chicken. I couldn’t get enough of the sauce we kept stealing tasting spoons full, like a kid drawn to candy aisle we kept going back. I served this with garlic mashed potatoes and wilted spinach (sneak in those veggies where you can;) ). This dish is simple and delicious. I can’t wait to make it for my next dinner party. 40 clove garlic chicken should be on the top of everyone’s go to recipe lists. Using a bit of paper towel pat dry the chicken pieces then salt and pepper generously. The paper towel removes the excess moisture allowing the chicken to brown quickly. 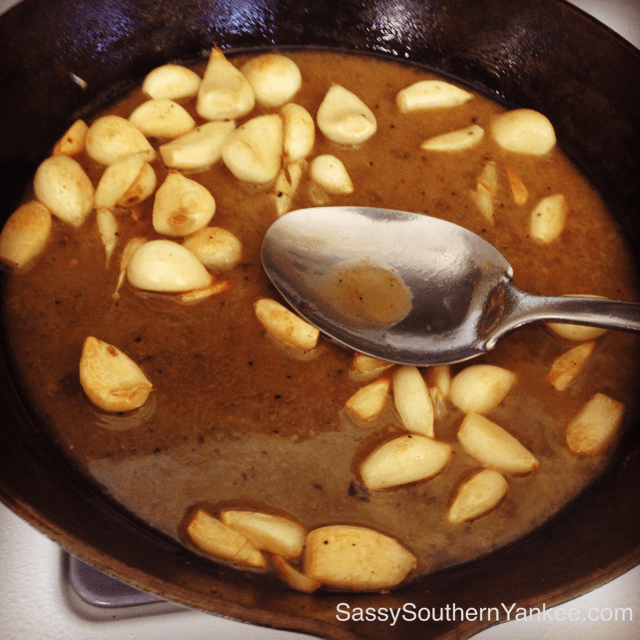 Add all of the garlic cloves to the hot skillet. 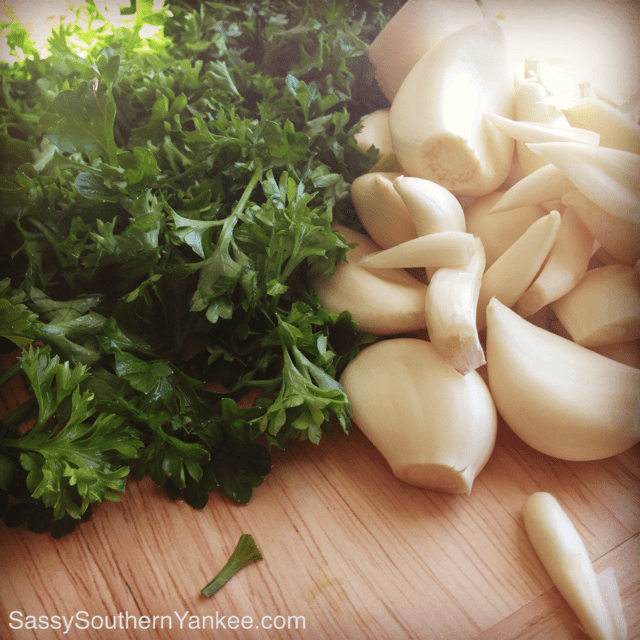 Allow the garlic to become fragrant stirring for about 1-2 min. Next add the white wine or chicken stock to deglaze the pan. (the alcohol will cook off but if you prefer please feel free to use chicken stock). Scrape all of the brown bits from the pan ensuring you get all of the wonderful flavor from the bottom of the pan. Add parsley and cream then return the chicken back to the pan. Cover with foil or lid. Cook in the oven for 30-40 min until the chicken is cooked through and juices run clear. I served this with homemade mashed potatoes with wilted spinach mixed in. I also stole a few cloves of the roasted garlic and threw that in to carry all those delicious flavors into the potatoes. 40 clove garlic chicken trust me you won’t regret it! I made this over the weekend, and was just expecting a normal baked chicken dish nothing special. I think everyone was shocked about how amazing this dish was. Seriously the sauce alone is worth it, then there was the tender and moist chicken. I couldn't get enough of the sauce we kept stealing tasting spoons full, like a kid drawn to candy aisle we kept going back. I served this with garlic mashed potatoes and wilted spinach (sneak in those veggies where you can;) ). This dish is simple and delicious. I can't wait to make it for my next dinner party. 40 clove garlic chicken should be on the top of everyones go to recipe lists. Heat a large cast iron skillet or dutch oven on high and add the olive oil. Once the pan is smoking hot add the seasoned chicken skin side down. Allow the chicken to brown for about 7-10 min. The chicken should release easily from the pan, if not allow to continue to brown. Once the chicken is a beautiful go lend color remove and set aside on a plate. 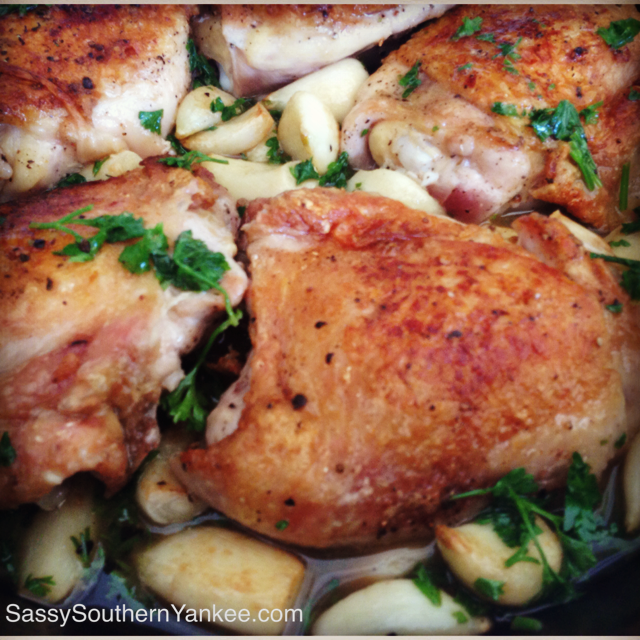 While the chicken is cooking work on peeling the garlic trust me you can do this in 1 min or less! Click for the trick. Add all of the garlic cloves to the hot skillet. Allow the garlic to become fragrant stirring for about 1-2 min. Next add the white wine or chicken stock to deglaze the pan. Scrape all of the brown bits from the pan ensuring you get all of the wonderful flavor from the bottom of the pan. Add parsley and and cream then return the chicken back to the pan. Cover with foil or lid. Cook in the oven for 30-40 min until the chicken is cooked through and juices run clear. 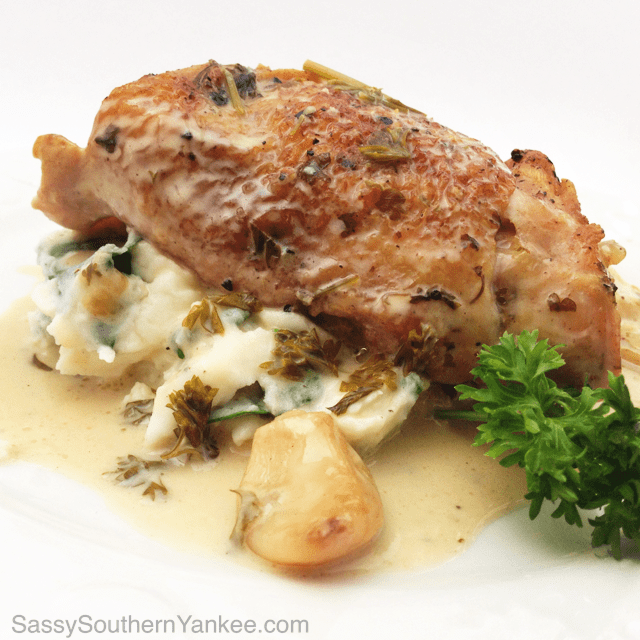 This entry was posted in Main Course and tagged 40 Clove Garlic Chicken, Chicken, Chicken Thighs, Comfort Food, Cream, Dinner Party Recipe, Garlic, Garlic Cream Sauce, Parsley, White Wine.